This is the 2nd stage booster of the Saturn V rocket on display at the US Space & Rocket Center on the grounds of the Marshall Space Center near Huntsville, Alabama. This stage has the -D in its designation indicating that it is a full scale development article intended to be used in testing. As a result, it was not given a vehicle number. 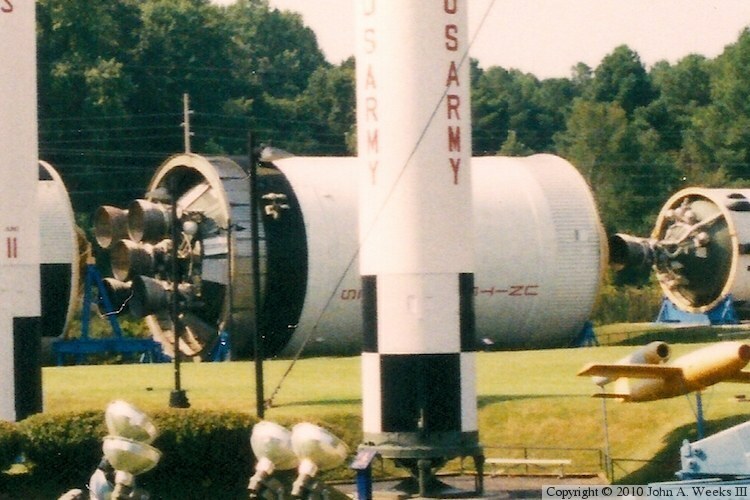 This rocket stage was on outdoor display for many years. It deteriorated very badly. Public outcry lead to it being restored and moved into a purpose built structure in July, 2006. This photo is scanned from a 4x6 print that I took in 2004. I apparently didn't take a photo of this specific rocket stage during my visit, but I found this view of the rocket stage in the background of another photo. I cropped that part of the scan and enlarged it resulting in this image. The resulting image is unfortunately obstructed and a bit grainy.